Is there a better alternative to Pin? Is Pin really the best app in Applications category? Will Pin work good on macOS 10.13.4? 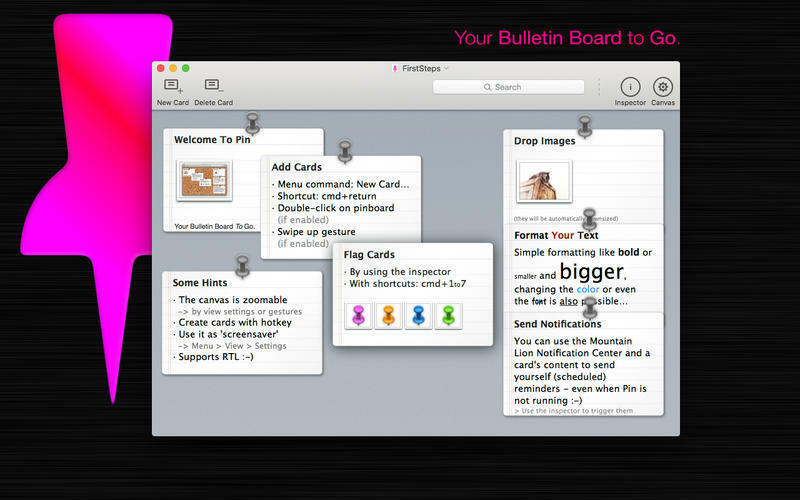 Pin lets you take your bulletin board with you. Anytime. Anywhere. Without a screwdriver. Ever wished you could carry your bulletin board around with you? Hate having to reorganize for every new idea? Wouldn't it be awesome to have as many boards as you want? With easy undo and redo? That you won't run out of space ever again? Pin needs a review. Be the first to review this app and get the discussion started! Pin needs a rating. Be the first to rate this app and get the discussion started!